My printer died, long live the printer! Up until recently I had been using an Epson Stylus Photo R2400 A3 printer for all my printing needs. It was brilliant. Unfortunately, printers, like all things on Earth, are not immortal and the inevitable happened. It gave me an error message to say that 'components in your printer have reached the end of their service life'. Yes there are fixes for this but all are temporary unless you are willing to fork out £200 to have it serviced by Epson. I decided I wasn't so bought a replacement; the R3000. The blurb was impressive. Droplet size nearly half the size on the R2400 means finer gradients and less gain when it's not wanted. New Vibrant magenta inks providing better colour and having both the black inks (matt black and photo black) installed all the time meant no messy change overs. In practice a lot of this appears to be mostly spin. First I have to say that having both inks installed is a good idea and means I am more likely to print on glossy papers occasionally where as I am mainly a matt paper person. It has it's drawbacks however which I will list below. The LCD display on the printer provides very helpful information with pictorial step by step instructions when needed. It's quiet, very quiet compared to the R2400 probably because the ink compartment does not move with the printer head while printing. It is easier to load think papers in this machine than it was in my R2400. No more mis-feeds and if it does it tells you exactly why and how to sort it. The ink cartridges are just over twice the size of the R2400's ink cartridges which means less time spent replacing ink cartridges and hopefully less ink wasted in spent cartridges, but they are twice the price. A real bonus - you can keep printing right up to the point the the ink cartridges run out without fear of ruining a print because the printer will just pause the printing while you change the cartridge and then continue where it left off. You won't be able to tell where it paused. This saves a lot of wasted ink and or paper. Switching between the black inks uses up a lot of ink by default. The printer flushes the tubes that run from the cartridges to the printer head of any remaining ink and these tubes are quite long because the cartridges do not travel with the printer head as they used to in previous models. You use 1ml of ink switching between Photo Black and Matt Black but 3mls switching back the other way! That's a lot of ink from a 24ml cartridge and a lot of money wasted. The printer does not retain the settings you last used after it has been switched off but reverts to it's defaults once switched back on. This could be a problem if you wanted your printer to keep to the Matt Black ink as the default is Photo Black. So once you turn it on it flushes out 1ml of Matt Black ink and there is nothing you can do about it but think about all the money you are wasting and knowing you will have to waste a further 3mls switching back again. You can't leave the printer on for more than 8 hours without touching it as it will power off. It is a good thing to have a auto power off option on a timer but to not allow you to leave it on permanently if wished is annoying especially as it doesn't retain it's last used settings once powered off. It's bigger than my old R2400 which for me is a bit of a problem as it had to fit in an alcove and now it's a bit tight, but at least I don't have to feed paper in from behind. There is a fix for both these issues however but they're not exactly well publicised particularly the ink issue. If you bring up the printer menu on the printer's LCD panel you can scroll to 'Setup' then select 'Printer Setup' and then 'Black Ink Change Settings'. Here you can select 'Economy' instead of 'Standard' which is the default. You will get a warning about possibly losing image quality but believe me, you won't notice it and it will save a lot of ink. It still performs a short head clean but it's much quicker than it is on 'Standard'. As for the default settings you can get the printer to stick to Matt Black but you can't save it as a default as such. To do this in Windows you need to go to your 'Start Menu' and 'Control Panel'. Select 'Printers'. find the Epson R3000 and highlight it. Right click on this printer and select 'Printing Preferences'. You will see the same dialogue box you get when you send something to it for printing but the difference is that here it will remember the settings even after the printer has been switched off. In fact, the printer doesn't even need to be on to do this. Set it to Matt Black or what ever default settings you want. You can even set the paper type you most use but that is not so crucial. Now when ever you turn the printer on it will remember these settings. Just remember though, if you change the ink during printing from whatever you have set as the default and turn the printer off when it comes back on it will change back to the default you have set so if, for argument sake, you, like me, have set your default to Matt Black, but you have a stake of glossy prints to print and so you switch it over to Photo Black, should you not finish printing the images but decide to come back to it later, if your printer is switched off in between you will need to go back into your printer preferences dialogue box BEFORE you switch your printer back on to prevent it returning to Matt Black ink. Why, oh why, could it not simply retain the setting it had when it was last used???? I have to say I was expecting something amazing from this printer on reading the blurb and reviews. Certainly a big step up in terms of quality from my R2400 so I was a little disappointed when I saw the results. I printed an image that was identical to the last image I printed on my R2400 using the same paper. I could see no discernible difference between the two. OK, maybe if I had taken a strong magnifying glass to it I might have been able to see that the R3000's print was smoother but who looks at photo's that close. Both images showed excellent detail and colour in my opinion. The R2400 is no longer in production as it was superseded by the R2880 which is still being sold in tandem with the R3000 but cheaper. The only real practical differences between the two is that the R3000 carries both black inks where as with the R2880 you have to manually unplug one and plug in the other and the larger ink cartridges in the R3000 but it not certain this will save any money. So, what it comes down to is how much are you prepared to pay out for these two features? Thanks for the support of the post!I share all of these same thoughts!This is good written article, thank you for sharing this with us, you have been liked! Hi Sally , I have just purchased and started using the R3000 but I am a little confused as to what quality settings I should have the printer set on for say Premium glossy Epson paper as I see with it set on max quality at 5600x1440 DPI whereas will the quality setting of 1440x720 give me a noticable drop in quality , it is quite ink hungry on the max setting . To be honest, I've not tried it with premium glossy paper. Most of my printing is on matt papers and I certainly can't tell the difference between Max Quality and Quality there. So far I have only used it set to Quality for glossy prints as I don't use that medium often and then only print gloss for personal stuff. If I do experiment I'll let publish my findings here. Hi Sally, just bought the printer and this may be a problem as the majority of my phtographs will be printed in matt. I will give epson a shout to see if you can change the default from photo to Matt. Please blog again if you can find a fix to change the default in the meantime? Yes you can change the default settings. Turn your printer off. In Windows (I don't know how to do this on a Mac but I suspect it's similar)go to Start>Control Panel>Printers. 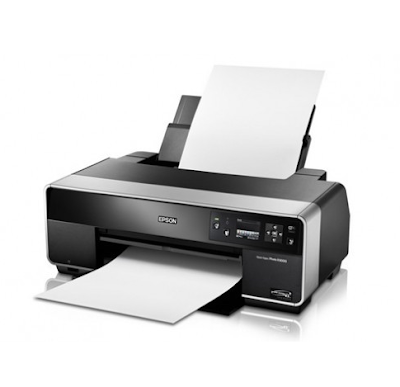 Now right click on the Epson Stylus Photo R3000 and select Printing Preferences. You will get a window that looks similar to your printer driver window when you go to print something. The difference here is that this window sets the default...at least that's the theory. I find it a bit temperamental in Windows Vista but I think this could be a Vista problem rather then an Epson driver problem. Now to set it to Matt by default simply select Matte Black Ink from drop down box. It will prompt you that the media needs to change as well but it will automatically change that anyway. Now click Apply and close the window. To check it has accepted it open the window again following the above steps and see if it still has Matte Black Ink selected. The reason I find this temperamental is because although I can get it to accept that setting as a default I can't get it to accept any other setting under the Mode heading which is frustrating as I always use either Adobe RGB or No colour management and the default is for Epson sRGB which I never use. Hi Sally, Thanks for the fixes. I've just bought an R3000 and checking on the printer's LCD menu screen under Printer Setup, I see it's possible both to change the Ink Change Setting to economy and to set to Power Off Timer to Off, 4 hours and 8 hours. Hi Sally, Thanks for your comments,I am still learning how to set my R3000 printer and have wasted ink. Points noted. Are the Epson courses any good? Sorry, I'm not familiure with the courses but they are proably good. Great review, very helpful! Thank you for posting it. We are just wondering about how long the ink cartridges last before needing to be replaced. In our design studio we would likely print about 40x A3 photo prints in a year, the rest of the time mainly coloured drawings on standard 80gsm paper. Just wondering how you've found the ink usage and if you would consider the cost of consumables to be quite high? Glad you liked this blog. I did read a review on the printer somewhere where the reviewer kept printing until the inks ran out and so was able to say exactly how many prints it will do but I can't remember where I saw it. If I do I'll add a link here. Failing that what I can say is I have so far replaced the yellow, light magenta and lt lt black just recently. The other colours still have lots of life but I've probably only printed about the equivalent of 20 A3 sheets. It would also depend on the images themselves. If they are filled with dark colours they will require more ink than a print with lots of very pale or white areas. Over all, it is far more economical than the R2400 was and after the warrantee is up you can always switch to a constant flow system. Nicely said, Not bad at all! Interesting piece of information. I find it to be honest, useful and fresh so thank you so much for posting this! Great review. I am sure readers who are searching for printer will buy that printer because of your awesome content writing. thanks for sharing. some bad points are serious concerns for me. anyhow will search more about how to fix them and than recommend it to my customers. I’m curious, I will give epson a shout to see if you can change the default from photo to Matt. The printer should start up with the black ink type active that was current when it was powered off. The problem is the driver settings which by default are set to photo black. So if your printer was last used with matt black it will go through a change once it is powered on if the driver is set to photo black. You can change this default but it's worth checking it before you start your printer up as it can revert back sometimes or you might have last used the printer on the other type of ink from which it is set and wish to continue in which case you will not want it to change. It would be better if it stayed on the ink type you last used and didn't change until you sent something to it to be printed that required a change. I just bought this printer and am so glad to have stumbled across this site. This printer replaced an Epson 2200. I'm using this with a Mac and was able to make the print changes on the actual printer. From the printer menu go to the tool icon then select Printer Setup. This allows you to change the black ink setting and turn the timer to Off, 4hrs, or 8hrs. I have also noticed that printing one sheet of matt paper at the enhanced matt paper (1440dpi) setting used up a lot of ink so I tried the same image using the plain paper setting at 720dpi. This used a lot less ink and there was no difference in image quality. In fact, it was better because the 1440 setting made the paper buckle slightly. The droplets are smaller so the 720 setting is fine. Unfortunately the 360dpi setting for draft printing is grayed out and would be nice for printing on thinner paper. The higher setting of 1440 is probably necessary on glossy prints. The prints I tested on special photo paper are stunning with no bronzing. And for those prints I don't mind spending a little more on ink since they are gallery quality prints. Hi Sally, thanks for the tip as I have just purchased the r3000 as well. I didnt do my research on ink cartridges being so expensive and the printer wasting ink for matte/glossy switch up so glad I read this. Does anyone know if this printer prints well with other (cheaper) inks/paper other than epson? Not tried any other inks myself as yet but maybe someone else reading this has. I was think why have the black ink here. and i wiped it with cotton. and I found your article. its really helpful. I have a question want to ask you. Hope I can get your help. I wondering if I print the Matte Black on Glossy photo paper will it look good? Or Photo Black on Matte Paper. Also I already selected it 'Economy' instead of 'Standard'. This blog should answer your question about using matt black ink on glossy paper. Hust copy and paste this url into your address field. You can use glossy ink on matt paper without fixative but I find the black is not so intense. thanks Sally for great review. Personally i use DeskJet 2544 which ues HP 301 ink and it prints great quality text doucments and images as well great saving for replacement ink as widely can be seen in market either remanufactured or compatible. Excellent information. As someone who was thinking of changing from my 2880 because of large ink consumption on changeover, I'm now not so sure. I own an Epson R3000 Printer and have always used the Mac Utility for performing the troubleshooting steps. I read through your blog especially the advantage and disadvantage of using Epson Printer and I think most of the listed out factors is accessible right from the LCD Printer Control Panel. I got really impressed when knowing about the ‘Black Ink Change Settings’ that can switch between Standard and Economy class. Can you please tell me where I can use the light Cyan, light Magenta, light Black and light Yellow cartridges on color printing. I would suggest that one can refer the Epson Printer Manual and then easily resolve the wear and tear issues accurately. Your printer should use these colours automatically. You don't have to do anything. There isn't a light yellow, just one yellow.